Community representatives from Barangay Basil show Megan McDermott (LINC) their water source and explain the difficulties in transporting water up a mountain through a series of multiple pumps to reach households. 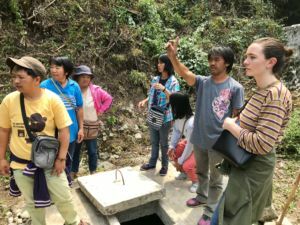 The Local Systems Practice (LSP) consortium is supporting USAID/Philippines Local Works in an analysis of water access issues in the Municipality of Tublay, Benguet. The issue of water access came to the team’s attention during the Mission’s Broad Listening activity (also supported by LSP) undertaken in 2018.The Local Works team solicited assistance from LSP, who, in partnership with local NGO, AKAP, returned to the community to further probe what water as an issue means (quantity, quality, use, etc.) and how USAID might be able to provide relevant assistance to improve water security in the municipality. In Tublay, LSP, AKAP and several USAID staff members met with a variety of local stakeholders. Discussions aimed to better understand current community solutions to addressing water scarcity, root causes of water scarcity, and current/previous activities related to improving access to water. The team met with representatives from the municipal government, as well as representatives from all 8 barangays – more than 120 community members in total. The initial, high-level findings from this week-long scoping visit will serve as the basis for a network mapping of actors who are involved in the water system. In the coming weeks, LSP, AKAP, and USAID/Philippines will conduct more in-depth research and network analysis to visualize how all stakeholders currently involved in water management (including government offices, landowners, rights owners, community groups, and private water distributors) are coordinating with one another. The ultimate objective of the network analysis is to serve the community as it strives to enhance coordination activities in order to secure sustainable access to water for multiple uses within the community.